Contacting Georgia 811 is the correct first step when taking on a project that involves digging. Making sure that utilities are marked before you dig can help you avoid a costly and/or dangerous mistake. However, the utility service providers in your area that are notified by Georgia 811 will only mark public utilities. It is likely that you have both public and private utilities on your property and you will have to hire a private utility locator to mark any private utilities that are in the area where you plan to dig. So, how do you tell the difference between public and private utilities? Public utilities are owned and maintained by municipalities or utility companies and are part of a large public network. Examples of public utilities are water mains, buried electric lines, gas mains, fiber optic and telecommunications lines, and sewers. When approaching a home, the public utility will usually end at the meter, or the point of service. (Points of service can also be a transformer, vault, valve, or junction box.) Having public lines marked is free after creating a locate request at www.georgia811.com or by calling ‘811’. 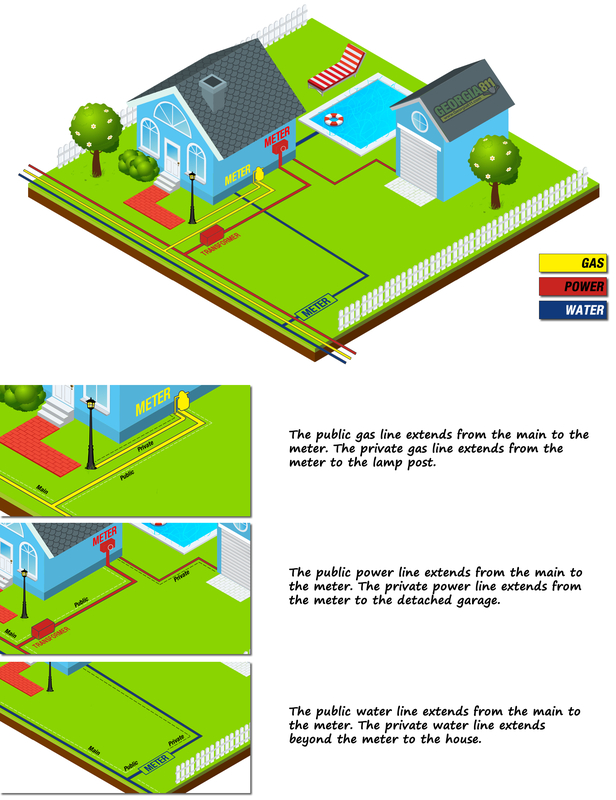 In the example below, public utilities include the main and lines running from the main to a gas, power or water meter. Georgia 811 will be an industry leader in promoting safety and preventing damage to utility facilities efficiently through high quality and economical notification service; providing education and encouraging compliance with applicable rules and regulations.